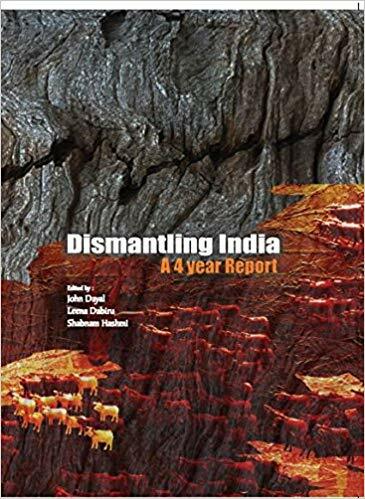 Four years of NDA governance with Narendra Modi as Prime Minister, reviewed and compiled in a new report ‘Dismantling India’, with articles by 24 writers, all critical on the government’s “actions, policies, and directives”, has said that the difference between earlier governments and the present government is that, the latter has reached the 50% mark of the 14 points which qualify fascism, warning, if it comes to power again in 2019, fascism would reach its peak. Research scholar Souradeep Roy, speaking on “unmaking Indian culture, said that the attacks on culture “is not only on artists and writers but on the common man, while current affairs commentator Subhash Ghatade added, things have reached a point where the right-wing, “which used to work covertly” has become out in the openly defiant. Prof Karen Gabriel of Delhi University said the present government has already silently introduced many regressive things in higher education. For instance, in higher education, the government has begun Sanskrit in a very crude way. “Students are made to opt for Sanskrit and no choice is given. The Sanskrit department has been asked to teach history through Vedas, distorting the history, introducing their re-writings of history covertly”, he added. Farmers’ leader Vijoo Krishnan said that, through the 2013 land ordinance Act, farmers’ land was sought to be protected, within six months of coming to power, NDA brought in a land ordinance to change its provisions. Well-known feminist Kavita Krishnan said the worst kind of attacks on women autonomy and rights are taking place under the present government. “The government has diluted many laws related to women. The fight by women rights group on triple talaq led to the Supreme Court giving its verdict, but the government is now bringing a law, which will give powers to police and state to criminalize Muslim men. Noted Hindi poet, essayist and literary-cultural critic Ashok Vajpeyi said that onslaught on India’s cultural institutes has begun with the appointment of such people as their heads who don’t have any experience on Culture. He added, Hindutva is nothing but a big threat to Hinduism, and if Hindu leaders wish to protect their religion, they must fight Hindutva. 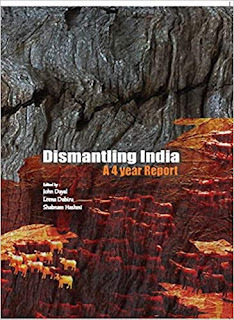 While another editor Leena Dabiru said that it was important thebook reached to places, from where the information is collected, third editor Shabnam Hashmi spoke on the need to have such more such document. Currently, the book can be bought online on amazon.in. The report, supported by a series of tables recording four years of Modi rule, includes list of hate speeches he and his party members delivered since he came to power in 2014. 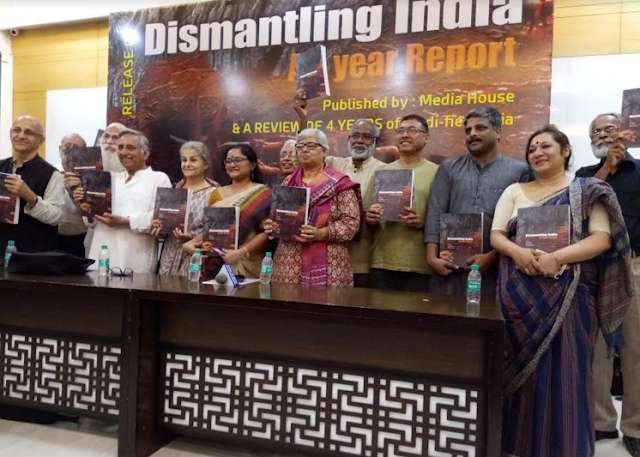 Others who spoke on the occasion included controversial Congress leader Mani Shakar Iyer, former Planning Commission member Syeda Hameed, noted economist Prof Arun Kumar, and bureaucrat-turned-activist Harsh Mander.